Did you know that every big movieplex has a secret fancy bathroom for when execs and movie stars come to visit? And did you know that those secret bathrooms are always clean and smell nice and have fresh flowers in ’em? And hand lotion? And Angelina Jolie has probly peed in it or something! Yep. This photo shows the secret Famous People Bathroom in the movie theatre at Richmond & John in Toronto. 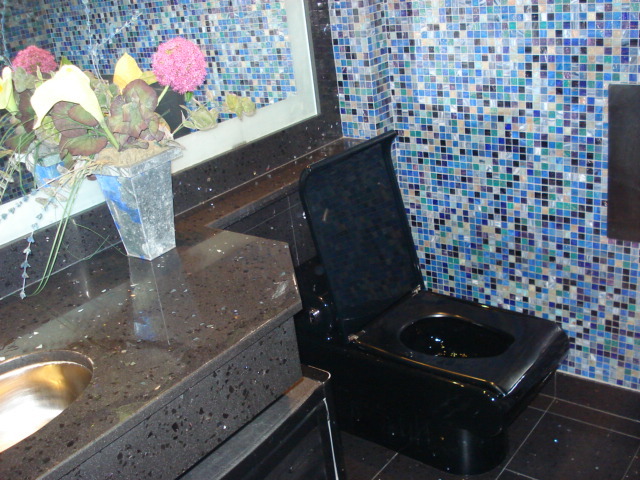 It has a black square toilet! And I peed in it! So that is one of the many ways Angelina Jolie and me have in common! This entry was posted on Monday, October 20th, 2008 at 3:30 am and is filed under acting, badassery, doppelgangers, film. You can follow any responses to this entry through the RSS 2.0 feed. You can leave a response, or trackback from your own site. The real question is How did you get in there? And also, How can *I* get in there? Aw, this was a very nice post. In thought I wish to put in writing like this moreover – taking time and precise effort to make an excellent article… however what can I say… I procrastinate alot and on no account seem to get something done.